Christina El Moussa‘s boyfriend, Ant Anstead definitely how to impress his girl. For the Flip or Flop star’s 35th, the British television star expressed his feelings for her in a grandest way: sky writing. 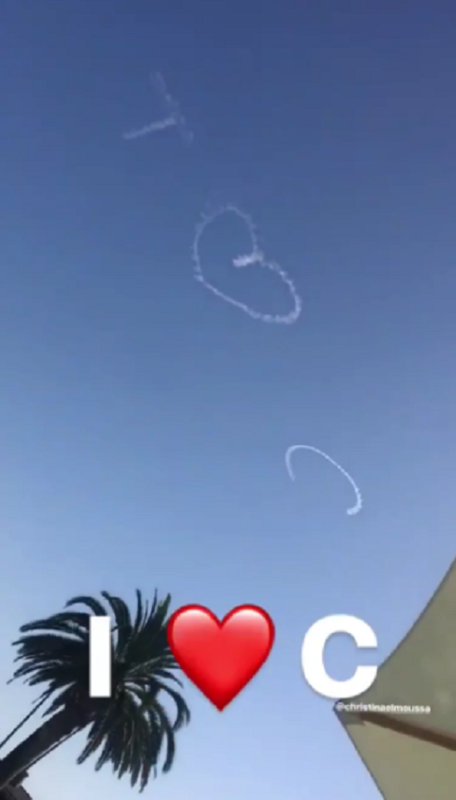 The For the Love of Cars co-presenter shared a video clip of the romantic moment on his Instagram Stories and the message in the clouds reads, “I [heart] C”. The video clip also shows the 35-year-old reality star lounging in a bikini beside a resort pool. Though Monday was Christina's special day, the couple has been celebrating all weekend. Ant, who currently appears on Discovery’s Wheeler Dealers, shared a video on Sunday in which he lets her know they were going on a surprise getaway. It’s @christinaelmoussa birthday weekend. So I’ve planned a few surprises ?? oh she’s so so so nosey!! ???? #RoadTrip ?????? ???? happy birthday to the single most amazing lady (now just sit back and chill.....??) x x x #HMF love you ???? Additionally, on Monday, he posted a bunch of photos of the couple enjoying a romantic dinner, video chatting on a plane and grinning and laughing with one another as they put on face masks. HAPPY BIRTHDAY to this absolute LEGEND!!!! 35 today!!! @Christinaelmoussa you make me laugh every single day! You are crazy! In a good way! An inspiration! You saved me! Oh and not too shabby for 35!!! Christina replied in the comments, writing, "Although I must admit I’m confused by your birthday photo choices. I love you. Gonna be the best year yet". The couple, who first met through a mutual friend, started dating in November 2017 and they are inseparable ever since. Christina previously married Tarek El Moussa in 2009, however, after nine years of marriage, the former couple got a divorce in 2018.